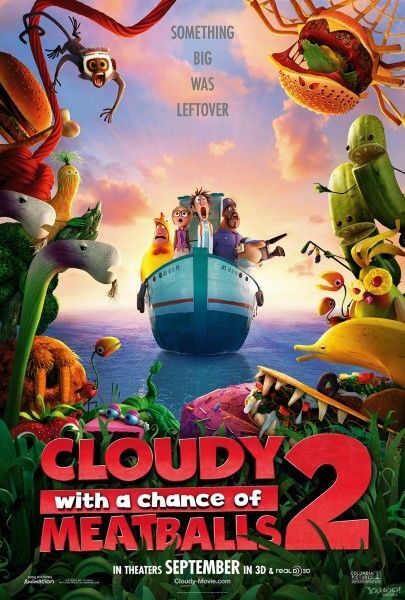 Cloudy with a Chance of Meatballs, 2009’s surprisingly terrific animated feature, deftly adapted a children’s picture book into a hilarious genre-blending mix of mad science run amok and action adventure disaster. Since its release, original writer/directors Phil Lord and Christopher Miller have moved on to helm 21 Jump Street and the forthcoming The Lego Movie. Now the reigns of the Cloudy franchise have been left in the capable hands of the original film’s storyboard artist and story team member Cody Cameron and Kris Pearn. Instead of a Frankenstein-ian/Roland Emmerich mash-up, Cloudy with a Chance of Meatballs 2 entwines a riff on Jurassic Park with a surprisingly pointed satirical denouncement of corporate culture. It’s strange to think that the most pointed critique of Steve Jobs & Apple can be found in an animated sequel to an adaptation of a children’s book. For more on the film, read Matt’s review. Anchoring the sequel yet again, Bill Hader and Anna Faris provide the voices to lead Flint Lockwood and his paramour Sam Sparks. The animated characters almost feel like doppelgangers to Hader and Faris, natural extensions of their live-action comic personas. In the following interview with Hader and Faris, the duo discuss having so much in common with their animated alter egos, the secrets to being a voice actor and how the success of the first Cloudy influenced their performances in part two. In addition, Bill Hader briefly touched upon providing voice performances for the two upcoming Pixar releases: The Good Dinosaur and Inside Out. For the full interview, hit the jump.